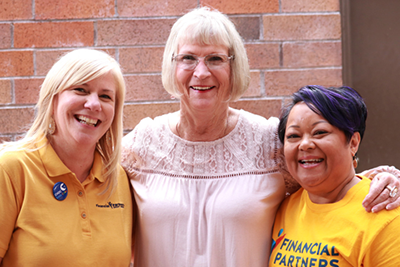 Catch up on what California and Nevada credit unions are accomplishing within their communities! 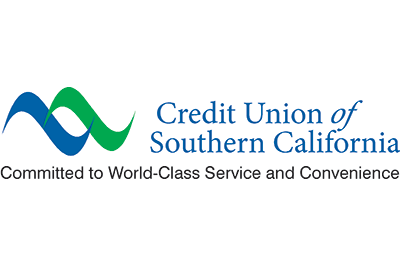 Member credit unions may submit their Members in the News items to membernews@ccul.org. To support disaster relief efforts, CLICK HERE. Los Angeles FCU is celebrating the milestone of reaching $1 billion in assets during the first quarter of 2019. This historic achievement was celebrated by Los Angeles FCU board members, management, and staff who are dedicated to offering a range of products and services, many account access options, and excellent member service. Elizabeth Rense Pavla, Executive Director, Retail Financial Service. Alaska USA FCU has selected three individuals to fill executive level positions: Elizabeth Rense Pavlas, Robert McNaughton, and Jeff Gregg. Pavlas has been promoted to the position of executive director, retail financial services. She was previously senior vice president, operations. Robert McNaughton, Executive Director, Business and Commercial Services. 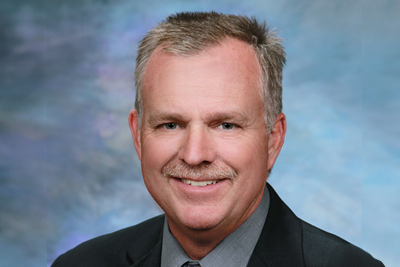 McNaughton is the new executive director, business and commercial services. 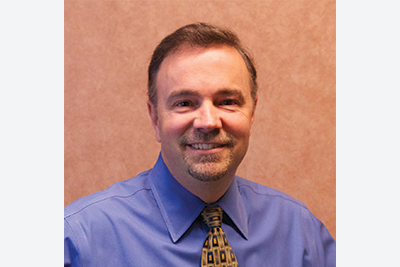 He has worked at Alaska USA for 15 years, most recently as vice president, business and commercial lending. Jeff Gregg, Vice president, Business and Commercial Lending. 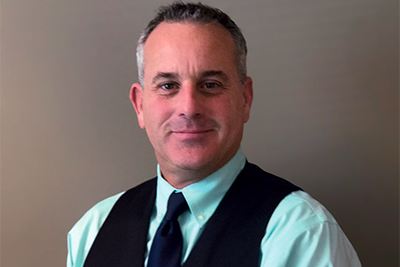 Gregg is now vice president, business and commercial lending. He has worked for Alaska USA for the last three years, most recently as regional vice president, commercial lending, pacific northwest. 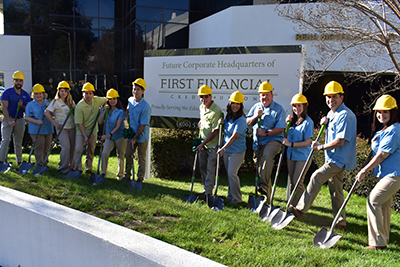 First Financial CU held an informal ground breaking for its future corporate headquarters. First Financial CU, headquartered in West Covina, CA, is relocating its corporate headquarters to Pasadena, announced CEO Carlton Musmann. 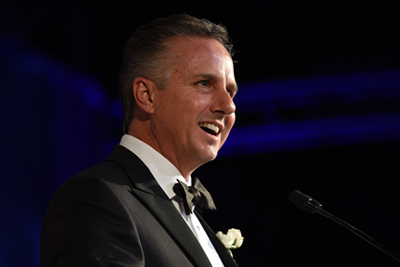 “We are looking forward to making Pasadena the home of our corporate headquarters,” he said. “We have been actively involved in the Pasadena community for more than 12 years—our flagship branch is on South Lake Avenue—and have a tremendous membership base there. We will be doubling the size of our office space and this will give us room for our continued growth.” The credit union’s senior management team and other staff members held an informal ground breaking last month and installed a sign in front of the building announcing the site is the future corporate headquarters. The move is expected to take place within the next 18-24 months. Los Angeles FCU (LAFCU) is celebrating the milestone of reaching $1 billion in assets during the first quarter of 2019. This historic achievement was celebrated by LAFCU board members, management, and staff. It is a testament to LAFCU’s vision statement: "To Be Our Members’ First Choice For Financial Services". Eighty-three years after its initial deposit of $65, LAFCU has 67,000 members and seven branches under the leadership of CEO Richard Lie. Redwood CU has recently been ranked the fourth healthiest credit union in the U.S. (out of approximately 5,400 credit unions), according to Glatt Consulting’s Credit Union HealthScore, which measures credit union strength and growth. The independent firm that studies the financial health of credit unions uses 17 performance metrics to calculate its Credit Union HealthScore, including financial and operational strength and growth, asset quality, asset/liability management, and productivity. Redwood is the only credit union to have been ranked in the top five in each of the last five years. Financial Partners CU raises fund for CHOC. Financial Partners CU recently raised funds for the Children’s Hospital of Orange County (CHOC) and took care of their team members through massages. All donations went to CHOC. L-R: Brian Hennessy, Meriwest CU Chief Financial Officer; Lisa Pesta, Meriwest CU Chief Human Resources Officer; Tony Cortez, Meriwest CU Chief Experience Officer; Julie Kirsch, Meriwest CU President & CEO; and Stan Chapman, Meriwest CU Board Chairman. Meriwest CU’s recently renovated flagship financial center, located on Chesbro Avenue in San Jose which, was recently unveiled to the public. 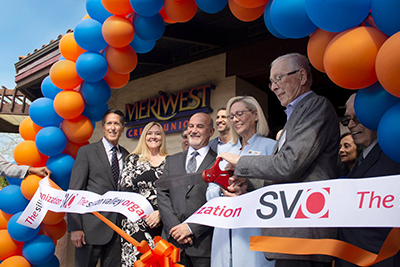 The grand re-opening and ribbon cutting was led by Meriwest CU CEO and President Julie Kirsch, District 10 Councilmember Johnny Khamis, SVO President Matt Mahood and San Jose Sharks Foundation President Doug Bentz along with Meriwest’s executive team and the board of directors. Mendell L. Thompson, America's Christian CU president and CEO. 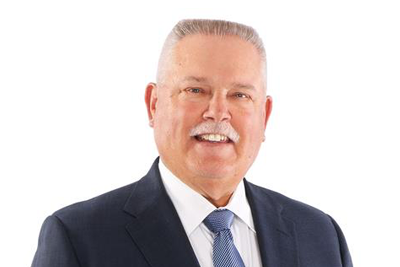 After 42 years of excellent and dedicated service, and 33 years as President and CEO of America’s Christian CU, Mendell L. Thompson announced his retirement, effective March 2020. David Justice, Executive Vice President/Chief Operating Officer of Alta Vista CU. Alta Vista CU has promoted David Justice to Executive Vice President and Chief Operating Officer. 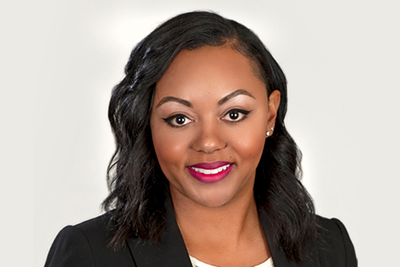 Justice has been with Alta Vista CU since 2015, most recently as Executive Vice President, and previously served as Vice President of Retail Services at San Bernardino School Employees FCU and earlier at Alaska FCU and Arrowhead Central CU. 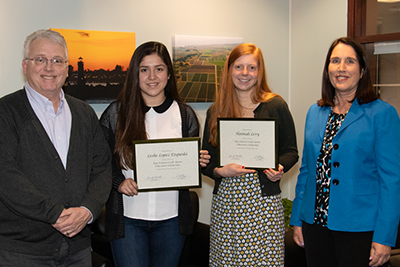 Bay FCU President and CEO Carrie Birkhofer and Chair of the Board of Directors Jim Phillips with two of the three Education Scholarship recipients—Hannah Levy and Leslie Lopez Ezqueda. Bay FCU honored the winners of its 2019 Education Scholarship and 2019 Mac McCormack Employee Scholarship at its annual meeting. Bay FCU President and CEO Carrie Birkhofer and Chair of the Board of Directors Jim Phillips presented the scholarships totaling $7,500. In response to higher housing costs, the Housing Endowment and Regional Trust (HEART) of San Mateo County, and Meriwest Mortgage, a wholly owned subsidiary of Meriwest CU will now allow new homebuyers in San Mateo County to purchase homes for up to $908,156. This represents a 14% increase from the previous maximum home price of $795,187. To accompany the increase in the maximum home price, the HEART loan program will offer up to $136,223 as a down payment second loan. To better accommodate middle-income families, and as the cost of living keeps rising, HEART has also increased the qualifying maximum household income from $150,000 to $170,000. Technology CU along with its employees and members, contributed more than $255,000 (a 34% increase from 2017) in monetary donations in 2018. The credit union also donated more than 400 volunteer hours, 340 school backpacks/school supplies for low income families and students, and more than 35,000 meals (a 42% increase from last year) to Second Harvest Food Bank. 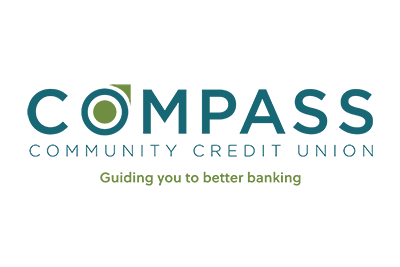 Compass Community CU has earned BauerFinancial, Inc.’s highest (5-star) rating for financial strength and stability. The credit union has maintained that top rating for 36 consecutive quarters. Earning a 5-star rating indicates the credit union excels in areas of capital adequacy, profitability, asset quality and much more. Patelco CU was received two Diamond Awards, which recognize outstanding marketing and business development achievements in the credit union industry. Patelco won the direct mail award for its New Member Acquisition Direct Mail Program, and the social media award for its Patelco Pet Calendar Facebook Activation. Brett Martinez receiving National Credit Union Foundation Anchor Award. Redwood CU President and CEO Brett Martinez received the National Credit Union Foundation presented the Anchor Award for his exemplary leadership during the 2017 California wildfires at its annual Herb Wegner Memorial Awards Dinner during the Credit Union National Association Governmental Affairs Conference in Washington, D.C.
Mike Reed, Safe 1 CU Board Chairman. Safe 1 CU recently appointed Mike Reed as Chairman to the Board of Directors. 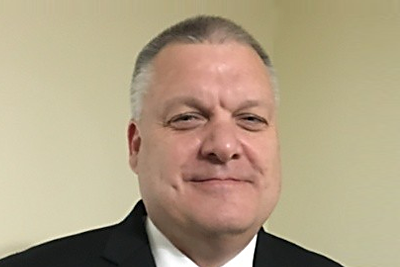 Reed has served as a Director on the Safe 1 CU Board since 2014 and previously served on the credit union’s credit committee for several years. CU of Southern California, through its new Whenever, However Appreciate Members (WHAM) program, showed gratitude for its members—by giving away $90,000 in gifts of appreciation in 2018. As part of the WHAM program which officially started in February 2018, each of the credit union’s 17 branches get a monthly sum of funds they can use however they want to show appreciation or wow members. Receiving the Blue Diamond Award for Meriwest CU (from L to R): Pia Guter, Vice President of Marketing; Susie Paredes, Santa Clara branch manager; AJ Elias, Vice President of Retail Delivery; and Helen Grays-Jones, Community Relations Manager. 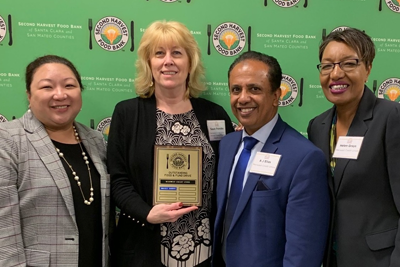 Meriwest CU was recognized by Second Harvest Food Bank of Santa Clara and San Mateo Counties with the Blue Diamond Award for its 2018 holiday donation and food drive. Meriwest CU employees donated more than$10,000 and 2,000 pounds of food, which benefited hundreds of local families. 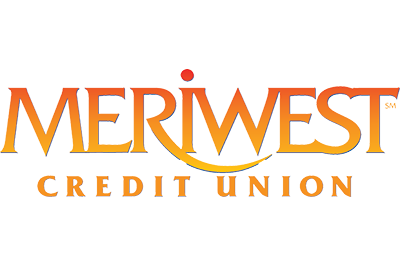 Meriwest CU has teamed up with Second Harvest Food Bank for the last 13 years as part of its commitment to ending hunger and helping people in the community. 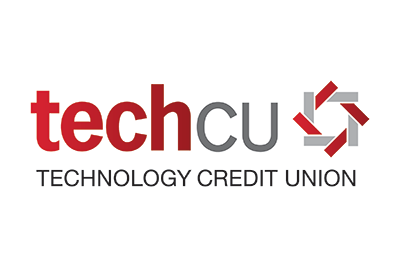 Technology CU was named the third best-performing credit union among 552 credit unions in the U.S. by S&P Global Market Intelligence, a leader in multi-asset class research data and insight. This is the second year in a row the credit union received this ranking. Tech CU is the only one of the top three from last year, to make the top three list again this year. The credit union also maintained its no. 1 ranking in California. The report ranks the nation's credit unions using five core financial performance metrics: member growth, market growth, operating expense as a percentage of operating revenue, net charge-offs as a percentage of average loans and delinquent loans as a percentage of total loans. 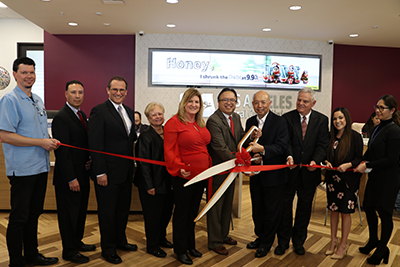 Richard Lie, Los Angeles FCU’s President/CEO (fourth from right) and Anthony Cuevas, Executive Vice President/COO (third from left) posed with Los Angeles FCU board members, branch managers, and dignitaries for a ribbon-cutting ceremony. Los Angeles FCU celebrated the relocation of their Van Nuys Branch by holding an Open House, which was attended by board members and officials, credit union members, and dignitaries representing city, county, and state offices. The dignitaries also presented official certificates to commemorate the occasion and participated in a ribbon-cutting ceremony. A prize wheel, raffle prizes, and informational brochures were available and everyone who attended received a special giveaway. Redwood CU has moved its San Francisco branch just a few doors down, remaining in Fox Plaza at 1390 Market Street. The new location is larger to meet member demand and offers enhanced features with a more open floor plan for improved interaction between members and staff. Additional consulting spaces are available for discussing financial needs. Three ATMs in a secure, in-branch vestibule provide 24/7 availability, and a technology bar with tablets are available to members to conduct digital transactions and inquiries. Los Angeles FCU Executive Vice President and COO Cuevas presents a $5,000 check to Francis Hardy, director of human resources at the Habitat’s Build Site in Glendale. 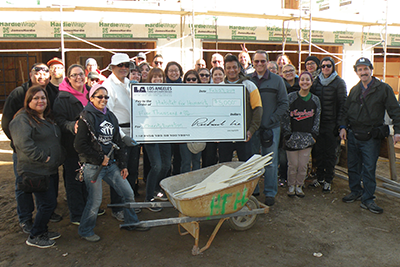 Los Angeles FCU employees and their family and friends, along with a supervising crew, helped six families build parts of townhomes at a Habitat for Humanity site in Glendale. Volunteers worked in groups to complete interior and exterior work such as caulking, siding, blocking, house wrap, and other finishing touches. Before the build, Anthony Cuevas, Los Angeles FCU executive vice president and chief operating officer presented a $5,000 check donation to a family. Erika Boulding, Redwood CU San Francisco branch manager. Redwood CU hired Erika Boulding as manager of its San Francisco branch at 1390 Market Street. The branch itself is also new, having just moved from its former office space, also in Fox Plaza at 1390 Market Street. 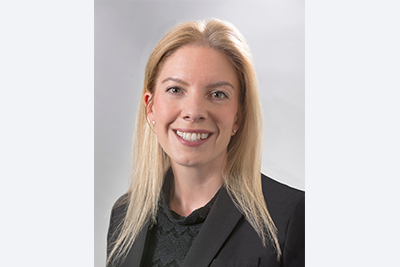 In her new role, Boulding is responsible for overseeing member service, staff management, and daily branch operations, as well as local community and business development efforts. Los Angeles FCU supports International Women's Day. 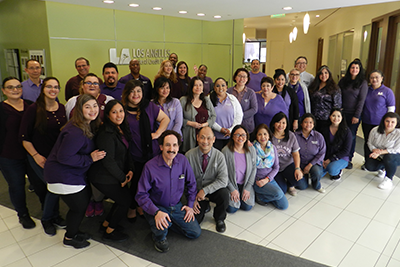 Los Angeles FCU employees donned purple clothing to support International Women’s Day on March 8, a global day celebrating the social, economic, cultural and political achievements of women. 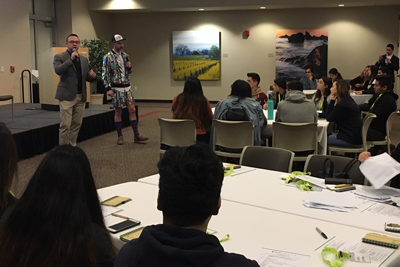 Redwood CU Human Resources Manager Will Thorn and talent acquisition manager MJ Salter talk to the students about the importance of first impressions. As part of a career exploration day, 33 students visited the Santa Rosa headquarters of Redwood CU where students learned what a career with a credit union is like. They took part in a workshop, toured the building, and participated in a discussion with featured panelists and departments.